California transplants who bemoan NYC’s absence of “real” Mexican food should be required to visit Tortilleria Mexicana Los Hermanos, a part-tortilla factory, part-Mexican cantina off the Jefferson L stop in Bushwick that offers $2.50 tacos made with tortillas that taste like they’re straight from an LA taco stand. The building that houses the BYOB restaurant is broken down into two sides: on one side, a cantina, and on the other, a warehouse, where the tortillas are made in front of you on a conveyor belt. When you enter the cantina side of the building, you’ll be required to write your order down on an index card, which you’ll find lining the stainless steel counter. Hand that to the cashier, and make sure you indicate your order is to stay (eating here is half the fun). You can grab a table on either side of the building, but the move is to sit in the warehouse, where the roar of the conveyor line teases your upcoming meal. Make sure to stake out a table stocked with bottles of the house-made salsa, which you only need a few drops of to satisfy any spicy cravings. 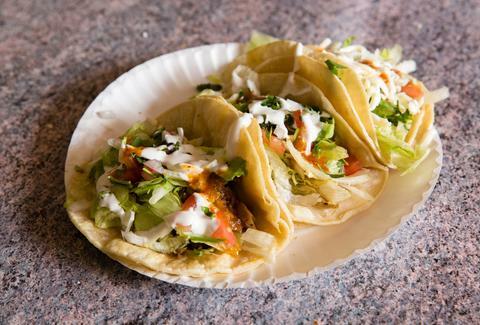 Each taco comes with your choice of either chorizo, steak, chicken, pork, or beans, topped with a heaping portion of sour cream, cheese, lettuce, and tomato. But as satisfying as the fillings may be, what sets this place apart from other taco joints in New York (cheap or not) are those tortillas. They might be the freshest you’ll get in the city, made just feet away and arriving piping hot and fluffy, with just enough crispiness to be sturdy. Be sure to order a few (or 20) extra to take home with you. Ciera Velarde is an editorial production assistant at Thrillist who can often be found at Tortilleria Mexicana Los Hermanos on Friday nights with a six pack of Blue Moon and three vegetarian tacos. You can follow her on Instagram.